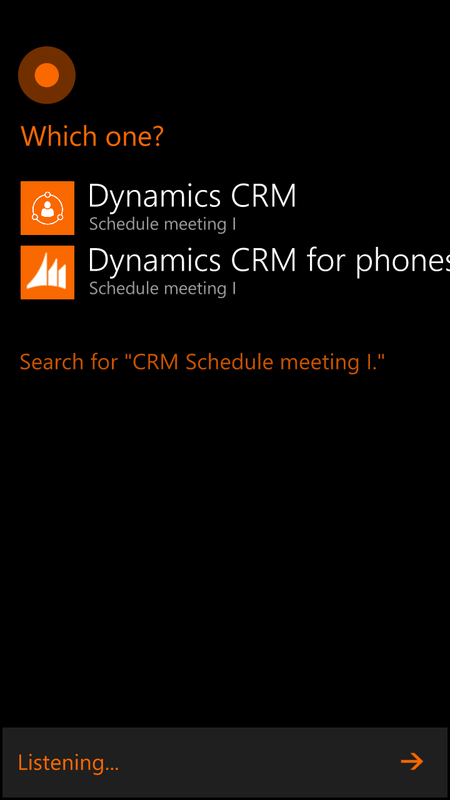 Microsoft recently released a new app for our beloved CRM system. It is available the the app stores. When using the new phone app, the user get much better experience now. It is very close to the Tablet app that was released earlier. You can now find two applications for the phones. The Phone App and the Mobile express app. The main difference is that the CRM Phone App is designed for CRM 7.1 (2015 Online Update 1) and later, while Phone express can be used with older versions of CRM. So if you have CRM OnPremise, you have to wait until Update 1 is released. My previous post about phone express app was mainly about using it with Cortana. So what happens when you install the new app and keep the old one as well? 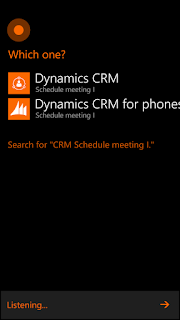 Both applications support the same voice commands, so when you say for example "CRM Schedule meeting" - Cortana will ask you back - Alright, which one you want to use? Then you must say which app to open and continue. I think this is a nice feature, now you can work with two CRM systems in your phone, as the settings for both apps is individual. I have the new Phone App set up to our demo (which contains Update 1) and the Phone Express app to the production (it does not have the Update 1 yet). Microsoft is one of the greatest companies out there! And their products always turns out good. It's good they keep updating themselves! Keep it up!! Well, these features are cool. We will see how it's working later.